Tokyo is one of the world's best food cities. Here, I'll introduce the best things to eat in Tokyo and where to eat it. Tokyo is best known for its sushi, ramen and izakayas. Every Japanese specialty and regional cuisine is available in Tokyo. Tokyo's French and Italian restaurants are among the best in the world. You'll find the most choices near train stations, office blocks and on the restaurant floors of department stores. Sushi: Tokyo is home to the world's largest fish market, Tsukiji Fish Market, so it's only natural that it would have the world's best sushi restaurants. Of course, there are some incredibly expensive sushi restaurants in Tokyo, but you can also eat delicious sushi for remarkably reasonable prices. See my Tokyo's Best Sushi Restaurants page for some of my picks. Ramen: Tokyo is a ramen lovers' paradise. You can find every type of ramen and every regional style in Tokyo. See my Tokyo's Best Ramen Restaurants page for my recommendations. 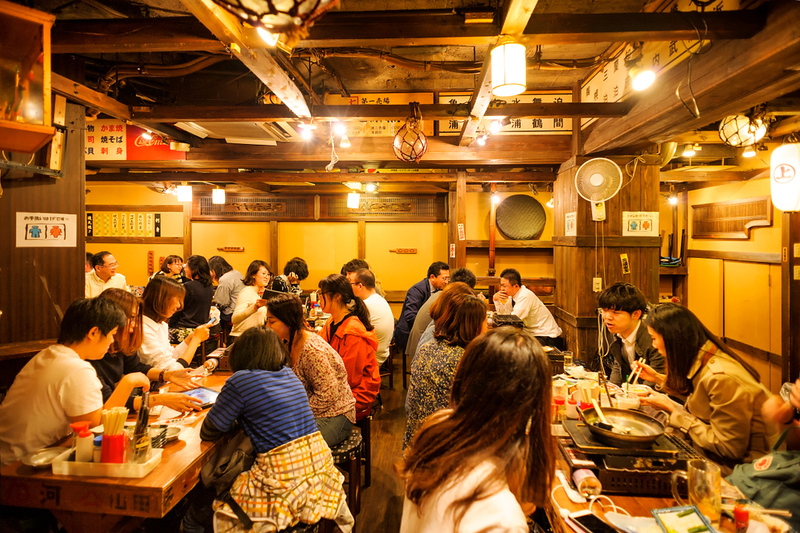 Izakayas: Japanese-style pubs, or izakayas, are restaurants that serve good beer and sake along with typical Japanese fare like sashimi, grilled fish, yakitori and vegetable dishes. They're super popular with the after-work crowd. See my Tokyo's Best Izakayas and Sake Specialists page for some picks. What Else Is Good In Tokyo? Needless to say, every other type of Japanese cuisine can be found all over Tokyo: tempura, okonomiyaki, kaiseki, unagi (eel), soba, udon, vegetarian etc. See my Tokyo's Best Restaurants page for my picks in each of these categories. In addition, you will find loads of great French, Italian, Chinese, Thai and Vietnamese restaurants in Tokyo. And, if you're after something more specialized, you'll almost certainly be able to find it in Tokyo. Where Should You Eat in Tokyo? You'll find the greatest selection of restaurants clustered around each of Tokyo's urban hubs like Ginza, Shinjuku, Shibuya, Roppongi and Tokyo Station Area. Many large office towers have their own restaurant floors and these are often great places to eat (just avoid the noon-1pm lunch rush hour). Department stores almost always have restaurant floors (often on their upper levels). Yeah, I know, eating in a department store sounds awful, but Japanese department stores are different. You'll find branches of some of the city's best restaurants on department store restaurant floors and these places are often very easy to enter. 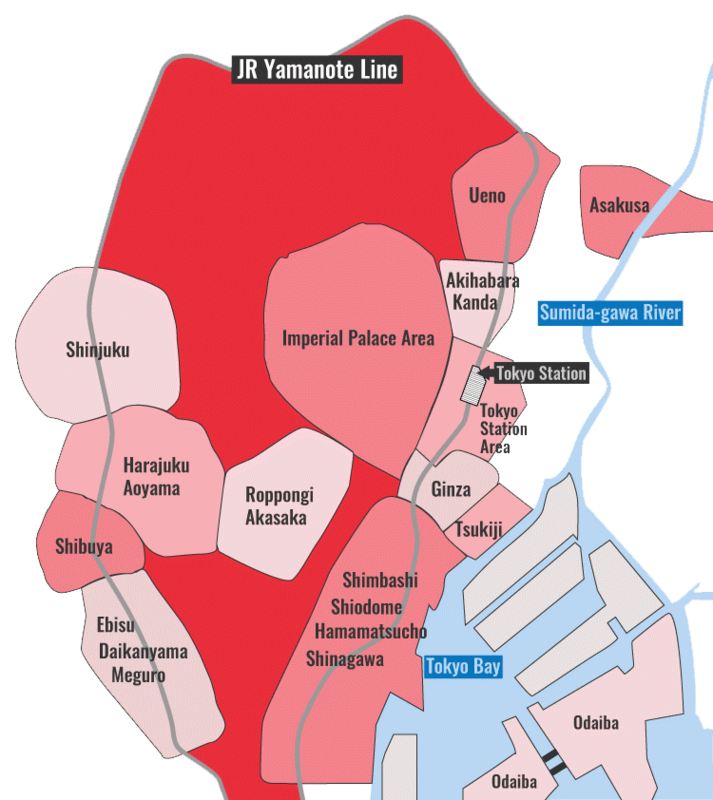 See my Tokyo District Pages for complete lists of recommended restaurants in each district. How Much Does It Cost To Eat In Tokyo? Budget: You can eat for as little as Y600 per meal at cheap noodle and rice joints. But, if you're willing to pay around Y1,000 per meal, you can eat some pretty good food in Tokyo. As always, dinner might cost a bit more. Mid-Range: If you're willing to spend between Y1,500 and Y2,500 per meal, you can eat some truly delicious food in Tokyo. Indeed, this is the real sweet spot for Tokyo dining. Luxury: At lunch, you can sample some of Tokyo's starred restaurants for as little as Y2,500 (although Y3,000~4,000 is more likely). At dinner, meals in starred restaurants will cost at least Y10,000 per person and spending up to Y100,000 per person is not hard to do at the real culinary palaces. For my money, if you're willing to forget bragging rights and forgo the famous places, you'll do best with highly regarded but lesser-known luxury places. What About The Fancy Places? Do You Need Reservations? Needless to say, you cannot just show up at Tokyo's high-end restaurants and expect to be seated. Some restaurants will accept direct reservations from foreign travelers and have English speakers on hand. However, this is not common. Some people have accused Tokyo's high-end restaurants of racism for refusing to accept direct bookings from foreign guests. Unfortunately, many such places have had bad experiences with foreign guests making bookings but then not showing up. As usual, a few bad apples have spoiled it for everyone. Thus, the best way to get a reservation at a high-end place is to book through your hotel's concierge. Another option is to use a specialized booking service (see following). Need More Help? My Restaurant and Trip Planning Services. My own tour company, Chris Rowthorn Tours, offers full consulting and guiding services. As part of our consulting and trip planning services, we will help you choose the best restaurants in Tokyo for your budget and tastes and then make bookings for you. We can, if necessary, arrange a guide to accompany you to a restaurant to help with ordering and to explain what you're eating. Please visit my site for full details.